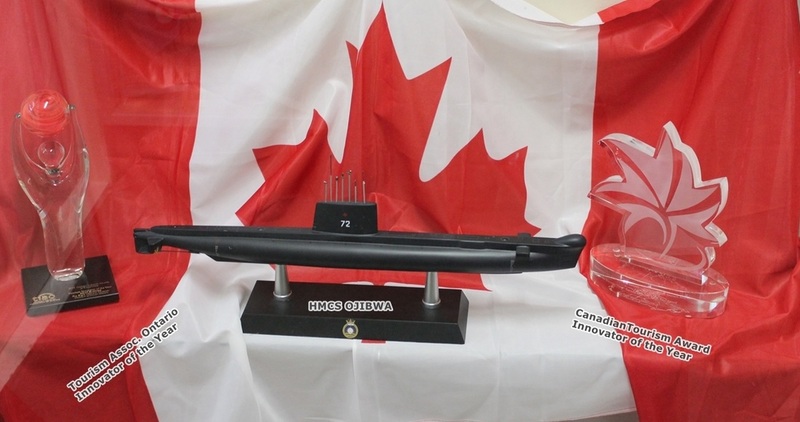 We are the Museum of Naval History- but you might know us better by the name of our Cold War warrior, HMCS OJIBWA: an Oberon Class Submarine, and the largest artifact in our collection. How a small museum in Southwestern Ontario came to have a submarine 90 meters (295 ft.) long and five storeys high is a story in itself. The Elgin Military Museum - in St. Thomas, Ontario is a private not for profit institution established in 1979 by local veterans from all services. This highly respected military museum managed to double its size twice in thirty years without government support. So, already in possession of two M113 APCs, in 2009, they asked National Defence for an old tank as the local Elgin Regiment had been a Tank Delivery Regiment during WW II. The reply came back that there were no tanks available; would EMM be interested in a submarine? And so began Project Ojibwa. Project OJIBWA - The story of how HMCS OJIBWA came to Port Burwell is spectacular because of the size of the prize, the mountains of red tape, tons of dredged materials, and the vagaries of Mother Nature that threw challenges at our team. The story's success is a credit to the skill of the museum engineering team who never gave up, the steadfast volunteers, and most of all because a small museum in an inland community in Southwestern Ontario identified a need tell the story of the Royal Canadian Navy in a part of the country 1,200 nautical miles from the sea. The thousands of people who turned out in all kinds of weather, all day and through the night to see HMCS OJIBWA make her way from Halifax to Port Burwell proved us right. The mystic of a submarine is compelling. It conjures up incredible deeds under arduous conditions. Visitors to HMCS Ojibwa and participants in our education programs leave with an indelible mark on their memory. The experience is all encompassing - everyone tries to imagine themselves living and working under the sea within the confines of this steel tube. It is an experience which has been recognized by two major tourism awards - the Brewster Travel Innovator of the Year Award from the Travel Industry Association of Canada, and the Innovator of the Year Award from the Travel Industry Association of Ontario both for our first year of operation.